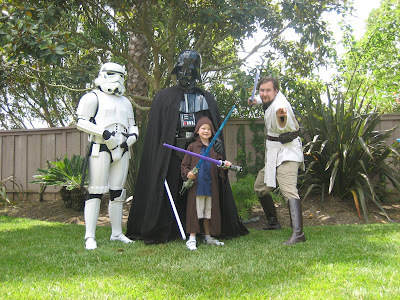 Max Mikulak - neuroblastoma angel: Star Wars: The Max Wars - Coming to a Theater Near You! 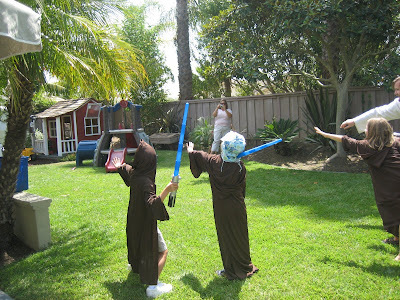 Star Wars: The Max Wars - Coming to a Theater Near You! The day started out fairly normal. We hosted a cub scout meeting at our house for Max's Wolf Den. The goal was to decifer codes and the boys earned some badges along the way. The meeting quickly deteriorated and the boys were off playing shoot 'em up. 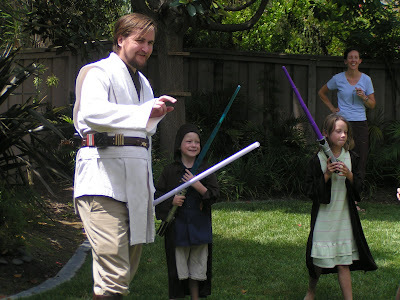 I found a box of robes and light sabers along side the house and thinking one of the other parents had brought them, I handed them out. "Stormtrooper, dance like a chicken," he said as he waved his hand. And guess what? Chicken dance! They tried a few others like act like a monkey, walk like an old lady, be a bear. Then he snapped out of it and fled. HA-HA!! Unfortunately for the Padawans, the Stormtrooper returned with DARTH VADER. The Dark Ruler of the Empire agreed to take a few pictures. But as you can clearly see he was not pleased with this. 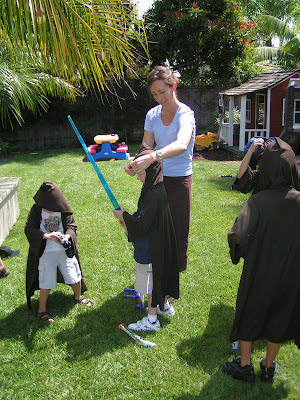 He even put up with some psuedo-sabering against the young padawans. 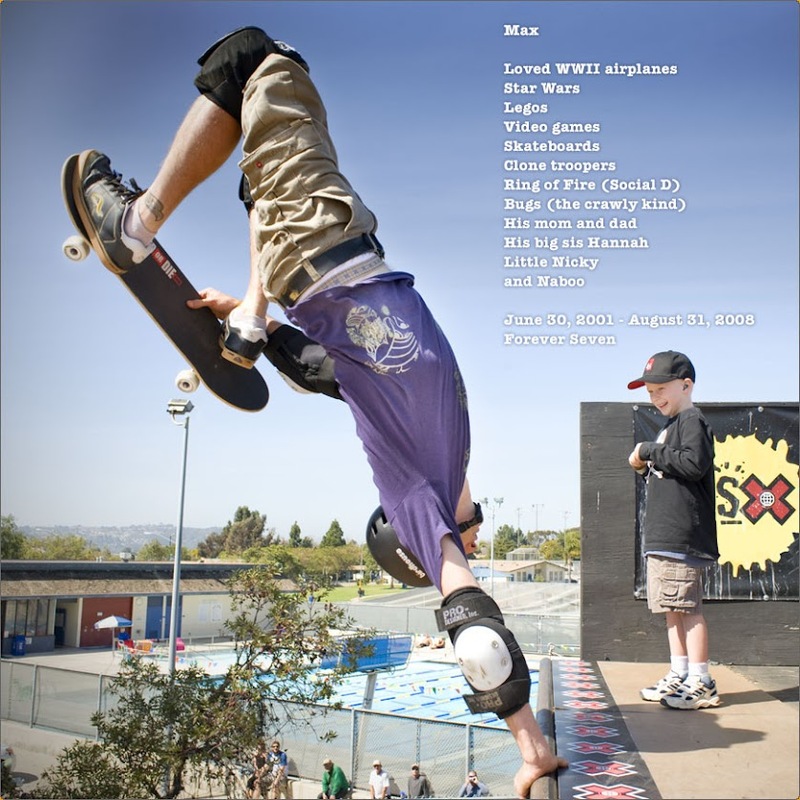 Produced, directed, edited, voice-overs, yadda yadda yadda courtesy Daniel Sturt, Max's teachers' husband. 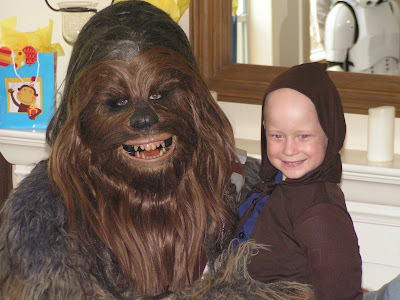 Well, thank goodness DV packed up the Death Star and left, (we found his keys for him), because CHEWBACCA showed up and he was in a great mood. 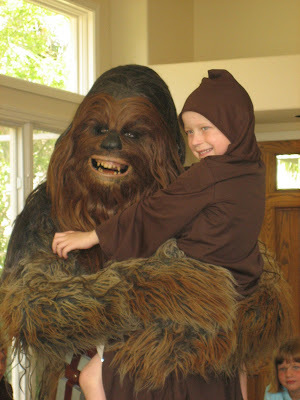 You do not want to be around a moody Wookie - they tend to pull arms off people. Instead, he simply picked all the small children up and talked to them. No one claimed to have any idea what he was saying, but I think all the men and boys understood perfectly well. Max loved this. 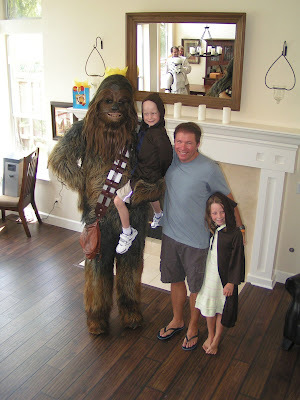 I mean, how can you go wrong with a great big furry Wookie? For even more photos & videos of all the kids with our guests please click here. These were taken by one of the SDSWS members. 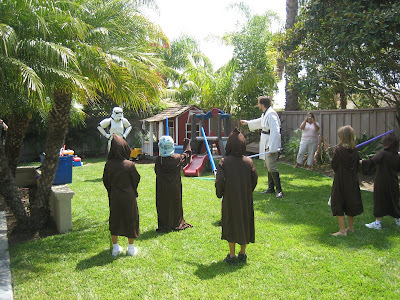 Lots of great video clips for the kids messing with the stormtrooper, battling Vader and more! Perfect!! Can't wait to see the rest of the pix's and hear all about it. These guys look for REAL! The picture with Max being held by Chubaka makes me want to smile as much as Max. I'm glad he had a great day! Max's smile says it all...what a cool surprise...from the coolest parents. The Max Wars! He is the greatest and bravest warrior I know. LOVE to see Max SO happy! What an awesome surprise! Looking forward to more pics. AWESOME! sending the force and love your way. That video is awesome and I love the determination in Max's eyes. It brought a huge smile to my face. Love seeing all the smiles in your backyard! What fun. 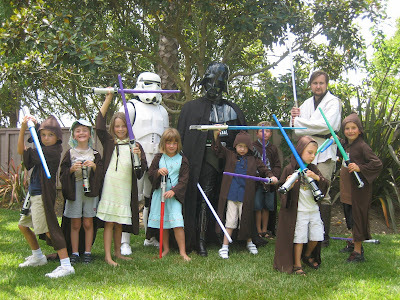 It was nice of Darth Vader to pose for some pictures with the kids after they fought him. You guys are the best parents!